The good news is I'm in the process of creating a new class on Religion in Film. The really good news is that I don't even have to start teaching it next week. Beating the procrastination bug for once, I've still got a few months to pull it together. Being constitutionally averse to reinventing the wheel (also lazy these days), I remembered to flip back through RiAH postings and was glad for it: many useful tips emerged. Even a full 2008 post by Kelly Baker on teaching American religion through film, with readers' suggestions and other links. Lots of movies have been released since then, of course, and undoubtedly many of you out there have discovered or taught films old and new. So let me reopen Kelly's invitation for suggestions, with a twist: what are some films set outside the United States that can teach us about religion? 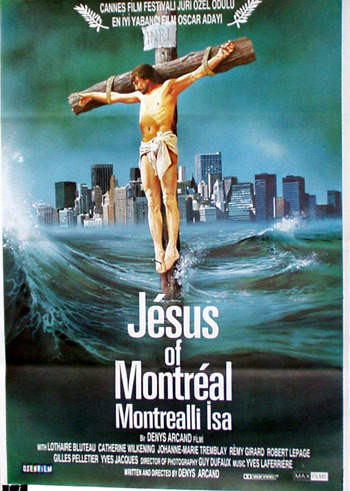 Jesus of Montreal (1989) comes to mind, or Pasolini's The Gospel According to Saint Matthew (1964). But what about films on religions other than the one starring Jesus? I've screened the All Jolson Jazz Singer (1927) in more courses than I care to remember. The one I'm developing now is offered by the department of Religious Studies, so there's no need to stick to North America or Christianity. (The not overly informative online course description: "Film representation of religions and spiritual traditions through their representations in film.") I'll ask my colleagues at MSU what they have had luck with when we finally get together next week, but any thoughts from the RiAH community are welcome. Ideally a course like this would be partially team taught, possibly with a few guest spots even the first time out. Along these lines, in closing, more "news" of the pre-Labor Day variety: next week I start teaching a new class on music in American literature: music as a theme in literature, literature about music, music as literature. It's been a while since I created a new class so it feels invigorating to shake off some of the cobwebs. On the other hand there's that worry: what if I'm overlooking some perfect text? It's never too late; if you have any favorites (fiction, poems, plays) I'd be happy to know about them. Andre Ruble by Tarkovsky. The Monastery: Mr. Vyg and the Nun. Ostrov. Babette's Feast. Pi by Aronofsky (set in the US but not Christian). I second "Of Gods and Men." As one colleague said, it's one of the few films where God is the real star. Great post, David. I just watched "Kumare" and I thought it could be really useful for tackling representations of Hindu religions and white New Agey-Spiritualism. I'm using it in my Asian Religions in America course. I have always been a fan of William Friedkin's _The Exorcist_ (1973), an incredibly rich film often obscured by its plethora of sequels, imitators, and poorly made pretenders. It not only allows you to discuss "the devil" as a real presence in religious lives, but also allows you the space to interrogate notions of faith and doubt, good and evil. The Original "Day the Earth Stood Still" is an excellent film to show the secularized Christ figure in modern atomic society. You could pair it with other secularized Christ SciFi films such as Armageddon, or with other alien visitation films such as Close Encounters to highlight the way that alien and numinous become fused. "Before the Rain" immediately comes to mind. Luis Bunuel's "Simon of the Desert," "Viridiana," and "The Milky Way." Ingmar Bergman's "The Virgin Spring" and "Winter Light." There are several good books/compilations on this by S. Brent Plate & Jolyon Mitchell. Some other films worth considering... for Judaism: some Woody Allen like Crimes and Misdemeanors, the Coen Brothers' A Serious Man. For Christianity: most anything Ingmar Bergman, Rossellini's Flowers of St. Francis, Malick's Tree of Life, Frammartino's Le Quattro Volte. For Buddhism: maybe The Burmese Harp by Ichikawa, The Cup by Khyentse Norbu, Eric Valli's Himalaya. You could also look at some contemporary art films that have sparked a debate about the "return" of religious art, like Bill Viola or Matthew Barney? Fascinating topic, it's a gold mine out there! Seven Years in Tibet. Bend it like Beckham's Indian wedding scenes could be useful. Gandhi might be useful, as well. Of course, these are popular Western films with their own POV. Might be interesting to look at the way religion and monasticism are portrayed in old kung fu movies (and in Tarantino's Kill Bill). The Mission, and Apocalypto. Russian Ark. In the 2003 film 'Onmyoji II', the story of Amaterasu (played by Kyōko Fukada) is revisited when the main character, based on Abe no Seimei (played by Mansai Nomura), assumes the role of the dancer in bringing the goddess back to earth. Susanoo is also a character in the film, played by Hayato Ichihara. In the 'Stargate' series, Amaterasu is a Goa'uld system lord who comes to Earth after Anubis's demise to the ancient device in Antarctica to form a temporary truce between Earth and the Goa'uld. She comes along with Lord Yu and Camulus. In 'The Three Treasures' Toshirō Mifune portrays Susanoo. In 'Little Prince and the Eight-Headed Dragon' Susanoo wishes to follow his mother, Izanami, to heaven when she dies, but his father, Izanagi, tells him he cannot." Peter Brook's film version of The Mahabharata (1989), either the mini-series or theatrical version. "The Mission" (DiNiro) would be good. "Mosquito Coast" has an underlying Science v. Religion theme. If you want to tackle portrayals of race in film, what about "The Green Pastures?" How about something more theologically driven like "The Adjustment Bureau?" or even "The Village." Thanks everybody for sharing your expertise, especially 123 for returning with more and yet more, and Kristian for reminding me that the course doesn't have to be organized around the world religions. I've got my viewing work cut out for me for the foreseeable future. Not a bad plight at all; somebody's got to do it. I notice no one mentioned "Religulous." Following on Kristian's reminder, it would be possible to pull out scenes that are religious in nature or speak to a certain view of religion from films that are otherwise not 'religious'. The famous scene from "The Gods Must Be Crazy" is a good example, as would be some of the scenes in "Breaking the Waves", "Pi", etc. The real trick will be showing a film about Judaism that isn't about either the Holocaust or that simply represents 'cultural Judaism' (e.g., Woody Allen) rather than truly religious Judaism. Same with other 'national religions' and the cultures they are a part of or engender - or, more to the point, films that focus on the cultures of nations with what are to Americans exotic religions. The question, 'how does one consider religion apart from culture and culture apart from religion' is interesting, as is simply attempting to define religion (cf. William T. Cavanaugh's survey of such definitions in "The Myth of Religious Violence: Secular Ideology and the Roots of Modern Conflict", Oxford University Press, 2009). On American Jews/Judaism -- Hester Street is great (immigrant conflict over religion/culture/assimilation). Lots of great Lower East Side details (Yiddish signage, seltzer, etc).